[By Nick] Happy New Year everyone! I hope your resolution is to eat more ice cream. My resolution on the other hand is to destroy this huge backlog of reviews I have. Lets start things off with a seasonal store brand offering that caught my eye recently at Price Chopper. It's well known that if something says cookies and cream on it, Dubba and I will buy it. Add in gingerbread cookies and I'm all over it! 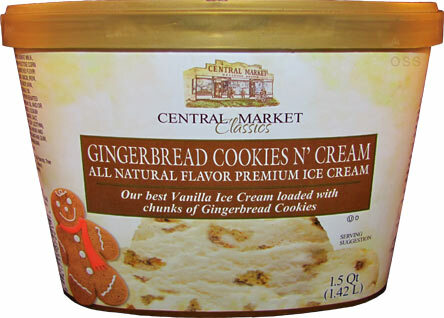 After my sub-par experience with The Fresh Market's Gingerbread gelato, I've been longing for a properly executed flavor incorporating one of my favorite seasonal cookies. So far so good, there's a far amount of gingerbread cookies mixed into the vanilla base. 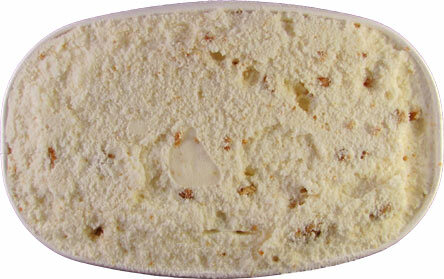 The quality is what you'd expect from a store brand ice cream. It's about as average as it gets. Not super creamy but doesn't melt too fast either from excess amounts of air whipped into it. The vanilla isn't much of a standout here. 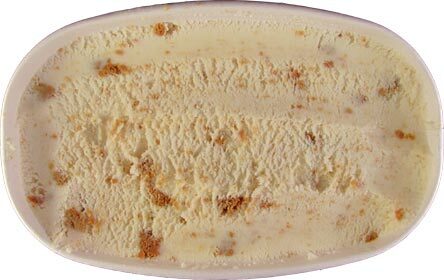 There's barely anything resembling a vanilla flavor and it just tastes like a sweet cream base. I just wish companies would ditch vanilla altogether by now in favor of vanilla bean. Even a weak vanilla bean base tastes more remarkable than any traditional vanilla. Thankfully i'm here for the cookies and they do not disappoint. 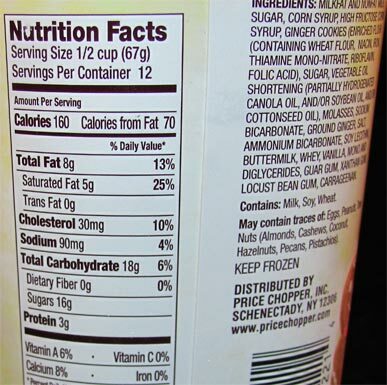 While there aren't too many sizable chunks, there's more than enough pieces mixed into each spoonful that you're not being shorted. The flavor is exactly how you'd expect it to be. Honestly, that's what you want from a gingerbread cookie. Too many times has a cookie been ruined due to over-spicing and that's not the case here. The spices are in proper amounts with ginger and clove being the strongest. Some of the cookies even manage to keep some of their integrity and not be just a crumbly mess which is a plus. This isn't going to blow you away by any means but it's a nice comforting flavor for winter and without any other companies offering it around me, I could see me picking this one up again. That is, if I'm not too lazy to just make my own sundae version of it. Verdict? Gingerbread cookies need to be used more! What a cool flavor! I wish stores in my area carried unique flavors like this. This is one of those flavors that is so limited that you better buy a case of to last all year long and hold you over until the following year. Thanks for sharing this review with us. Sadly, this grocer is nowhere near me being in Birmingham, Alabama. Gingerbread is my favorite holiday treat and never really sees its fair share during the holiday season. This ice cream looks absolutely delish! And of course there was Festivus and its later incarnations. Unfortunately, the Blue Bell Gingerbread House flavor was not released this year. I was bummed. I will forever miss Edy's Gingerbread Man. Given how they like to come out with new stuff every year, I have always been surprised that Turkey Hill doesn't make one.